Local honey! It doesn’t get much sweeter because this stuff comes from a hive populated by Toronto bees. 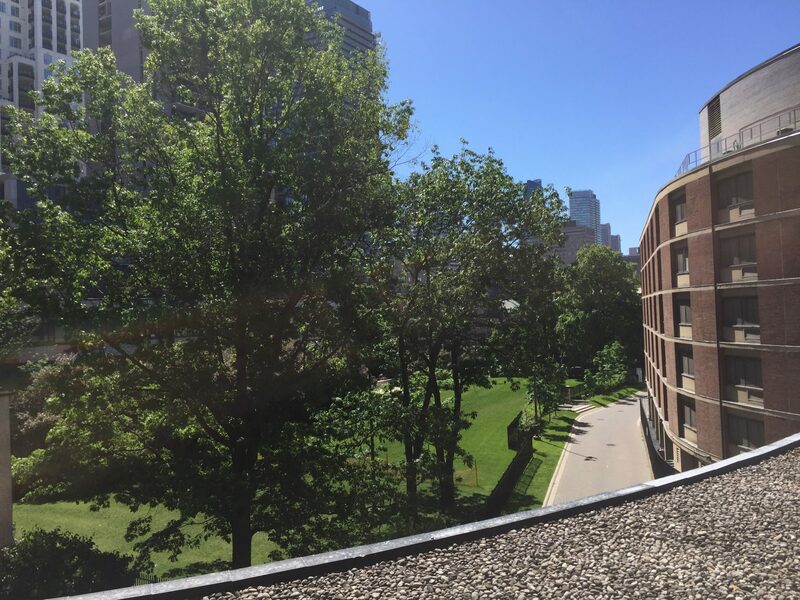 Believe it or not, the newest location for honeybees in Toronto is on the second-floor roof of the Colonnade, at 131 Bloor Street West, where two hives were installed yesterday in a sunny spot overlooking the soccer field at the University of Toronto’s Victoria College. 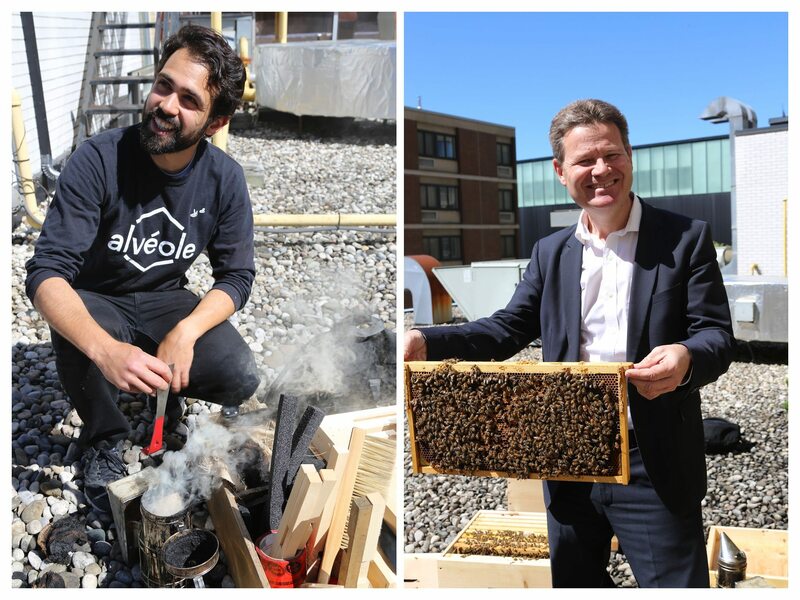 The hives are being installed and maintained by Alvéole, an urban beekeeping company based out of Montréal. 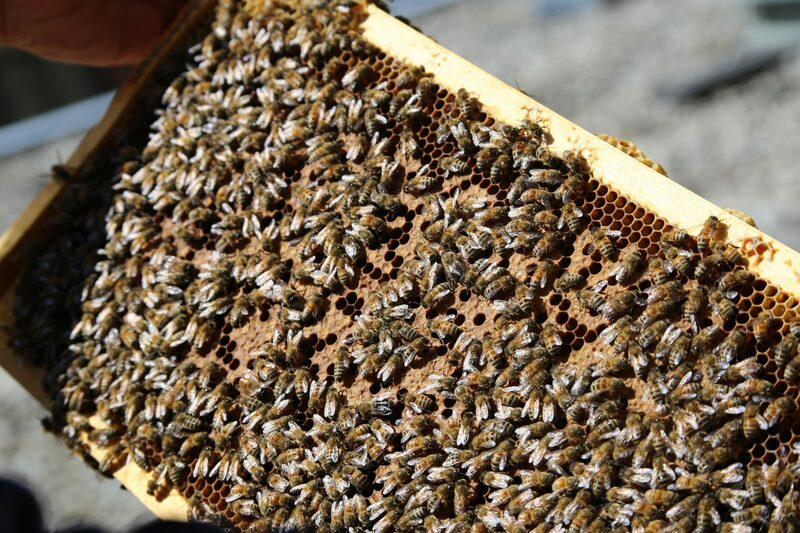 They have big operations in Montréal, Québec City, and Toronto, and even maintain hives in Illinois and Ohio. Patrick, the Alvéole beekeeper, runs us through some bee facts as we ride the elevator to the roof along with the two hives. 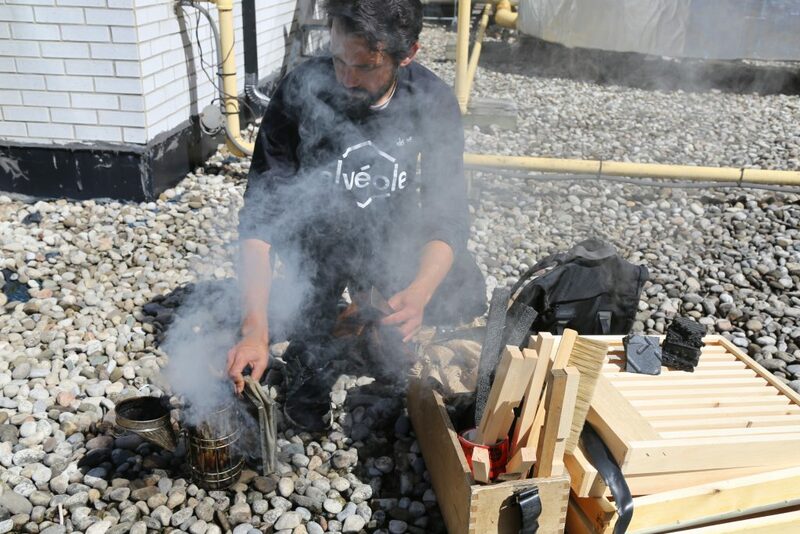 On the roof, Patrick starts cutting up pieces of car tire to use as feet for the bee hives; he then lights up his smoker with smouldering pieces of rough burlap. Many people think that the smoke makes the bees go to sleep, but the real reason it protects the beekeeper is more scientific. Bees do a large part of their communication through pheromones, and when you open the lid on a hive, their instincts kick in. They start gorging themselves with honey in case they need to abandon the hive, and release pheromones to tell the other bees that the hive is threatened. The smoke interferes with the pheromones so that the panic signal doesn’t spread. Left: Patrick starting up his bee smoker. Right: Scott Harris holding one of the frames from inside the hive. Scott Harris, the property manager for 131 Bloor emerges from the other side of the roof, and he and Patrick start to figure out where to put the hive. The best place, Patrick says, is away from any air intakes, noise, and vibration. It’s also good to have a spot that is sunny in the morning and shaded in the afternoon. The early morning sun helps heat up the hive and get the bees going for the day, while the afternoon shade helps protect them from getting too hot after they come back from foraging. Hives can be put on tall buildings, though if they have to fly up more than about 17 or 18 floors Patrick says they start to waste too much energy going up and down all day. The smoker starts to get going. The car tyre feet for the hives can be seen on the right. The life of bees is fascinating: we tend to think of a single bee as a single organism, but there are lots of ways in which a whole hive of bees functions like a single unit. They usually have one queen who lays all the eggs, and who can live for roughly two to three years. The worker drones have much shorter lives, averaging around 30-35 days. At any one time, about a fifth of the hive is old enough to go on foraging missions to find nectar, and the rest are growing up and working inside. Those who do go looking for nectar can go about 5km from the hive, so you might see the Colonnade bees all over downtown Toronto! If a hive gets too big, another queen will usually be born, and the hive splits into two, with one half going to seek another spot to colonize. Patrick says it’s similar to how the cells in your body split during mitosis, with the Queen as the cell nucleus. The other bees can usually tell when the Queen is getting too old because her pheromones begin to fade in strength. When that happens, they feed some of the eggs a special pollen-rich type of royal jelly that tells the egg to develop into a Queen instead of a normal worker. Eventually a new Queen will take the place of the old one—“It’s very Game of Thrones in there” Patrick says. 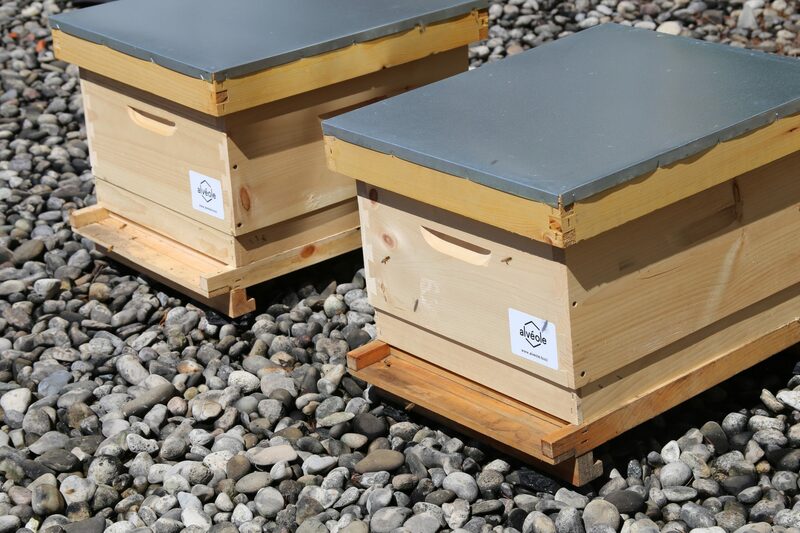 Urban beekeeping helps to boost bee numbers and educate the public about some of the threats to bee populations. One big threat is the Varroa mite from Asia, which co-evolved with Asian honeybees, but started appearing in Europe in the 1940s, brought by global trade. Since the European honeybees that were brought to North America did not co-evolve with the mite, they are much more vulnerable to it. The mite quickly spread around the world, and by the late 1980’s, Mexico and Canada closed their borders to US bees. Since then, beekeepers have been trying to keep the mite at bay and to breed European bees that are mite-resistant. Bee-loving businesses can help out, even if they don’t have the capacity to maintain some hives on their property. It’s easy and fun to plant pollinator gardens that will provide good sources of nectar and pollen and bloom throughout different times of the year. 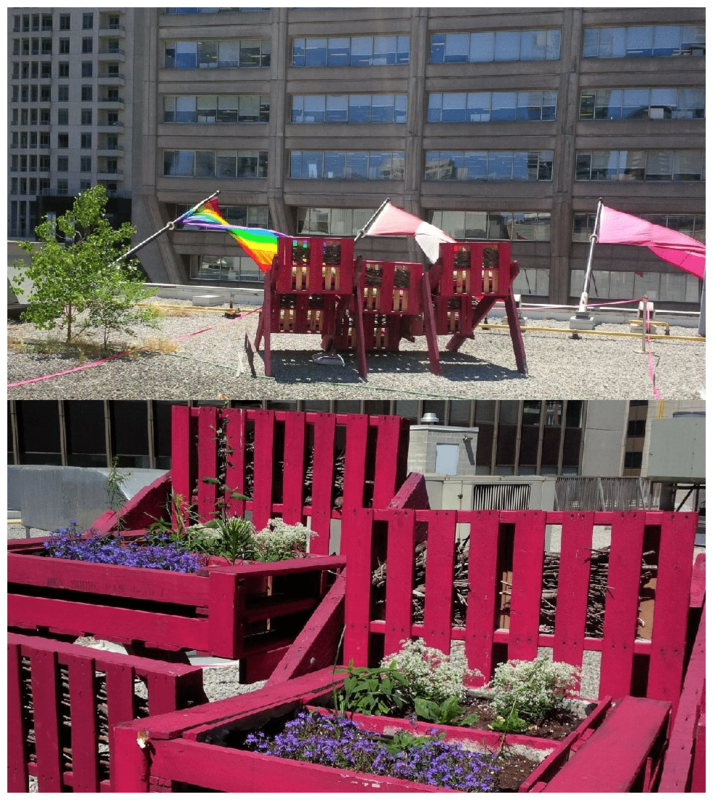 Holt Renfrew has a pollinator garden hidden on their rooftop right behind the flags that adorn their main entrance on Bloor Street. Now in its second year, the garden is full of blooming perennials and has twigs stacks that give a good resting stop for the bees. If you want to create a good resting stop at home, Patrick says you can also hang a bundle of sticks from a tree in your backyard. For those thinking about starting a pollinator garden, there’s no better time to start—this week is National Planting Week. From June 5th to June 12th, Bees Matter, a partnership initiative of a group of large farming companies and associations, is encouraging people to plant pollinator gardens across Canada. They are offering free seed kits and advice, so that you can stock your garden with plants that will keep bees and other pollinators thriving. In addition to their enormous pop culture impact, bees of all kinds are a vital part of our ecosystem, even in cities. The City of Toronto has been very keen to help out pollinating insects and raise public awareness. They have been developing a comprehensive Pollinator Protection Strategy and will be unveiling a pollinator-themed art installation this Friday, June 9 at Nathan Phillips square, which you can follow using #KISSESFORBEES. The Chief Planner recently held a roundtable meeting with biodiversity as its main focus, and the City is soliciting input on its pollinator strategy through an online form. The two hives at the Colonnade are contributing to a larger effort to make the city more pollinator friendly. But what about the honey? Scott tells us that it will be given away to his tenants, including to the Rosedale Day School, who will pay a visit to the hives in September. The honey will be harvested in late October—and you can bet the Bloor-Yorkville BIA will be back to take photos of the big event to share. Story by Ben Coleman and Kelly Pettinger. Photos by Kelly Pettinger. Scott Harris is a board member of the Bloor-Yorkville BIA.